On Monday, we learned a little bit more about the up and coming Garth Brooks World Tour. In an email to his ‘Circle of Friends’ newsletter, it was announced that Garth will be heading to Ireland and Crooke Park on July 25 and 26 as the big symbolic kickoff event. 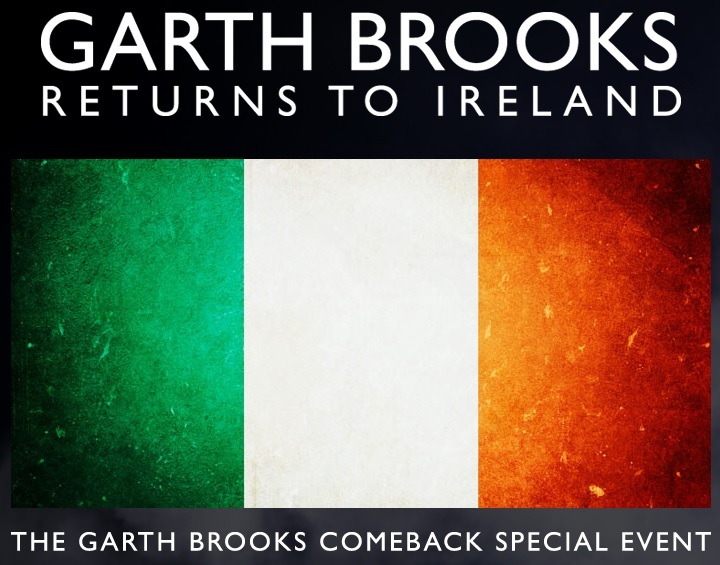 The event in Dublin will be called ‘The Garth Brooks Comeback Special Event’. The part that is most interesting to State-bound Garth fans is that the comeback tour will begin in the fall of 2014. I do not believe we have had a hint at when the tour was to begin, but now we know it’s going to be ‘Fall 2014’ and sometime after July 25 and 26. It’s fun for Garth to kick it off back in Ireland, where he taped one of his awesome concert specials. On the marketing front, an insanely smart move by the marketing major from Oklahoma State University for a couple reasons; first, Ireland and the UK loves Garth Brooks, he’ll sell out that show in minutes with both UKers and fans from around the world. Second, starting his tour over in Ireland makes headlines and makes him even more wanted by US audiences. Seeing Garth perform in Ireland will only make his fans want to see him more in the US knowing it is jut mere weeks away. I wouldn’t be surprised if tickets for the rest of his tour go on sale on about July 27, with Dublin and Crooke Park majesty still burned in fans’ minds.